The week of September 18, 2017 was mostly a positive week for the U.S. equity markets. NASDAQ Composite declined but other major indices advanced. Four S&P 500 sectors – Energy, Materials, Industrials and Finance – also advanced. S&P 500 and Dow Jones Industrial Average have been up for six months and had only one down month since October 2016. The broader, Wilshire 500 Total Market Index has had only two down months since February 2016 – October 2016 and August 17. The U.S. Market continues it up trend. 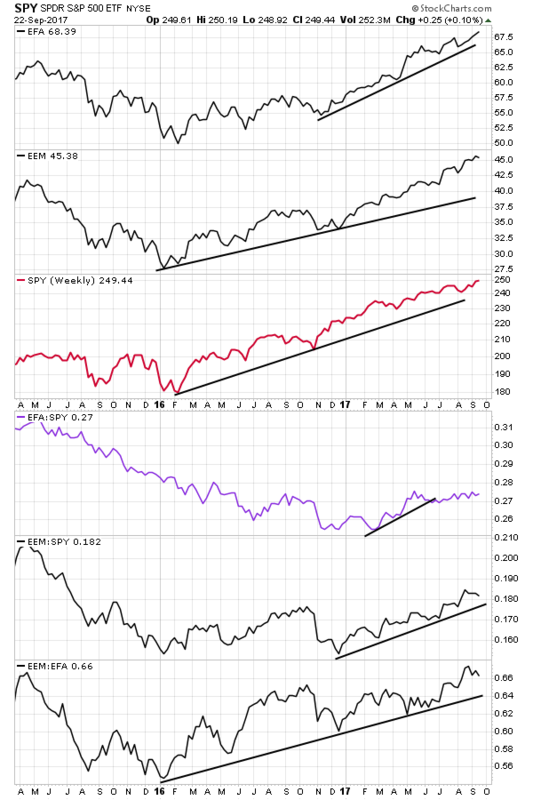 Major equity indices are trending up in a up-sloping channel. Dow Jones Industrial Average is hugging the upper limit of the up-sloping channel on weekly time frame (see Chart 1). The 14-week RSI is showing a divergence, i.e. the price is making new highs but the RSI is not. The 10-week ROC and its 10-week Moving Average are trending down for the past few months at least since 2017. The technical indicators for other major indies are similarly placed with few differences. 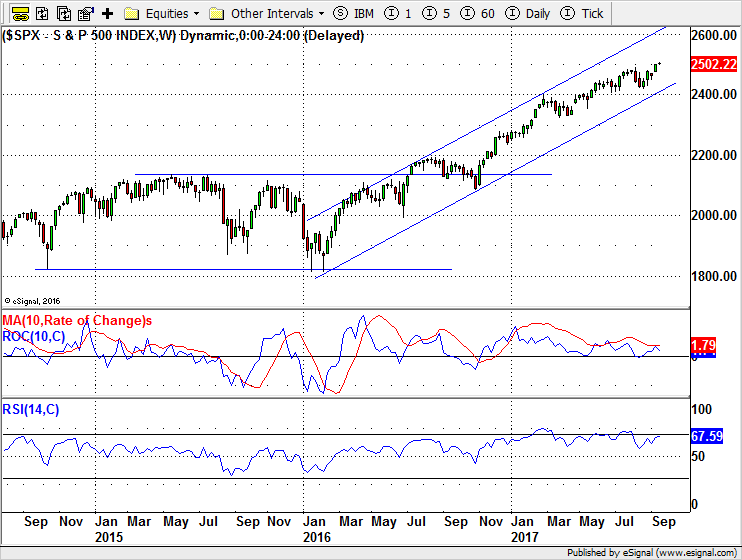 S&P 500 (see Chart 2) is moving up within the up-sloping channel and its indicators are similar to that of DJIA. 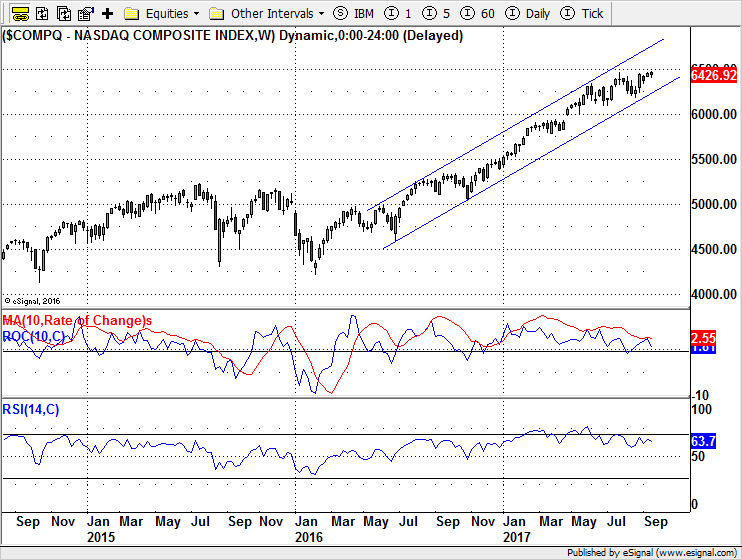 NASDAQ Composite’s weekly chart (see Chart 3)is similar to that of the S&P 500 to a large extent. Russell 2000 is also trending up but unlike its larger cap brethren, it is not moving up in a channel (see Chart 4). The upper limit limiting its upward move is shallower than other indices. 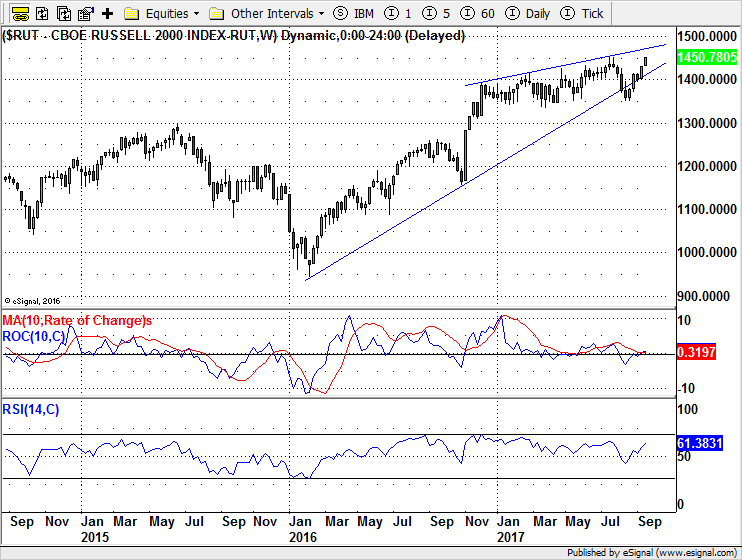 Its RSI has been flashing divergence for longer and its ROC is narrowing for longer time period too. 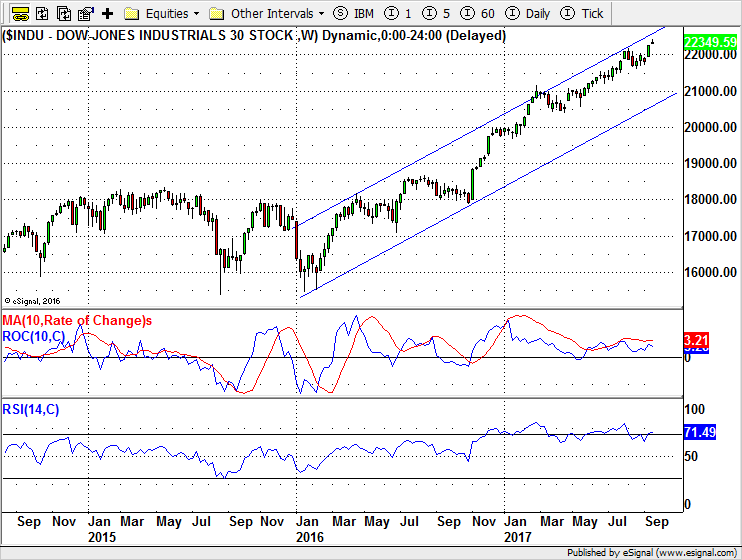 The RSI divergence and slowing ROC do not always indicate that the trend is in any immediate danger of reversing or stopping but they do call for caution. The state of U.S. economy is strong. 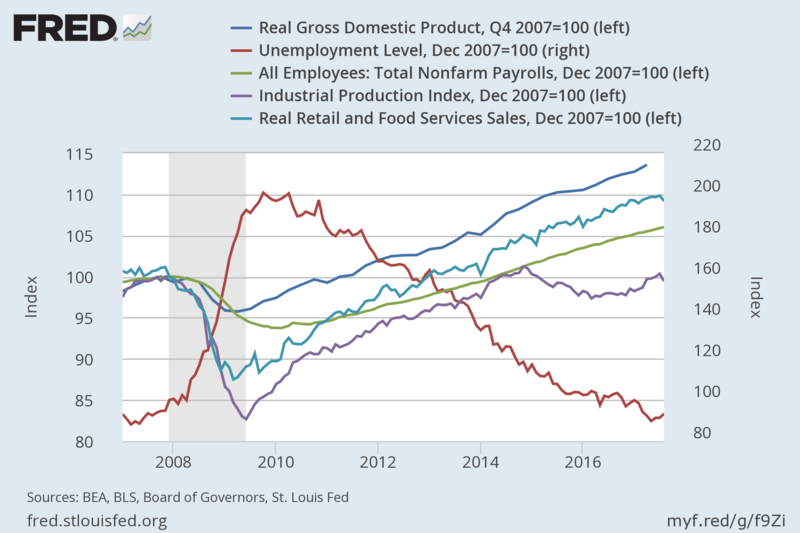 The trajectory of all of the components of Market Remarks Economic Gauge ( see Chart 5) is in the right direction since late 2009. 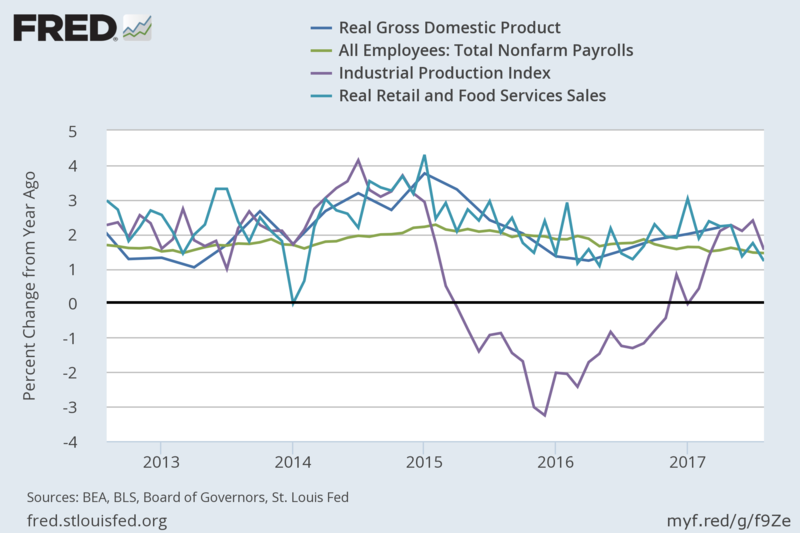 The Unemployment Rate is pointing down, Real GDP, Industrial Production, Retail Sales and Total Employee Count is moving up. One relative basis, i.e. year-over-year change, the economy is doing alright (see Chart 6). The annual Employee Count growth is between 2.2% and 1.4%. The annual Retail Sales growth is fluctuating around 2.00%. The Industrial Production slacked off from mid-2014 to late-2015 but since then it is improving and has reached 2.0% level. The pace seems to be slowing off-late, which calls for some caution but nothing to be alarmed about. The fears of deflation are far in the rear-view window and the inflation is benign (see Chart 7), though persistently low, which, in itself, is concerning in our opinion. 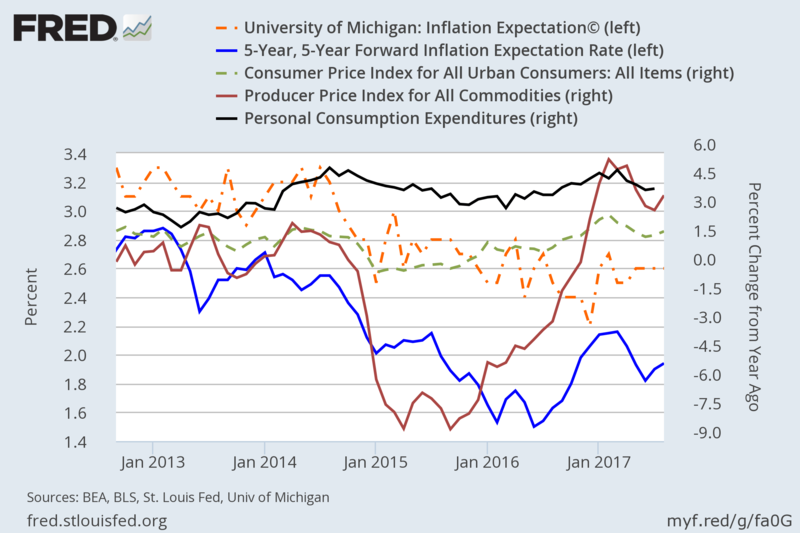 Although, the consumers’ inflation expectations or the University of Michigan Survey (orange dotted line in Chart 7), is hovering around 2.5 for some time, it is trending down. The same is true for the 5-Year, 5-Year Forward Inflation Expectation Rate (the blue line in Chart 7). This measures expected inflation over five-year period that begins five-year from now. The CPI (green dotted line in Chart 7) is below 2.% , though, it has risen from near zero reading few months ago. The spread between 10-Year Treasury Yield and 2-Year Treasury Yield is, mostly, trending down since 2010 (Chart 8) but is nowhere near the level that raises the fears for recession. 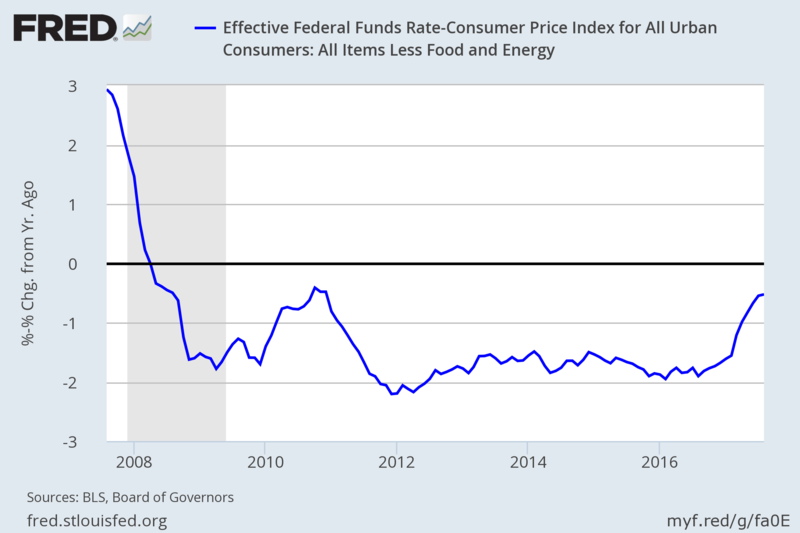 The Fed Funds Rate Minus CPI is negative (Chart 9). It is gradually rising since 2012. The Fed policy is still accommodative. The earnings and sales numbers of U.S corporation are in good shape. According to FactSet, the estimated Q3 2017 earnings growth for S&P 500 companies is 4.2%. Eight sectors are expected to report earnings growth for the quarter. 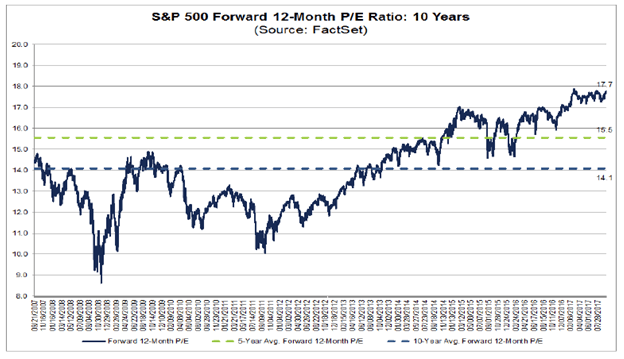 The valuation seem to be stretched as the Forward 12-Month PE ratio are above 5-year and 10-year average (see Fig. 1). 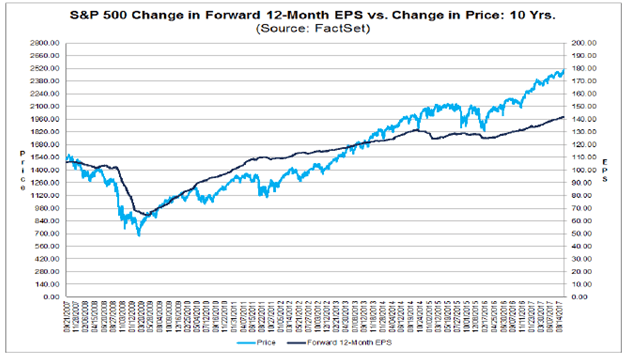 The price is also much extended compared to Forward 12-Month EPS (see Fig. 2). 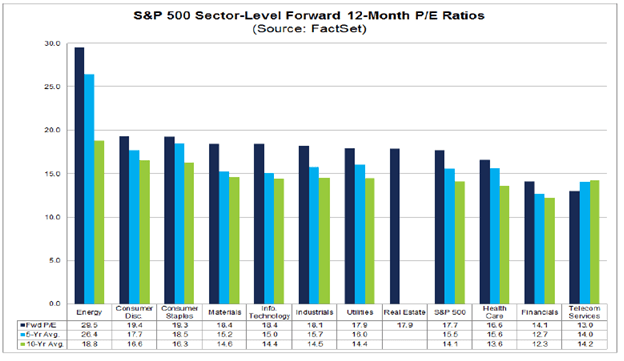 The Sector Level Forward PE Ratio is also extended (see Fig. 3). This calls for some caution. 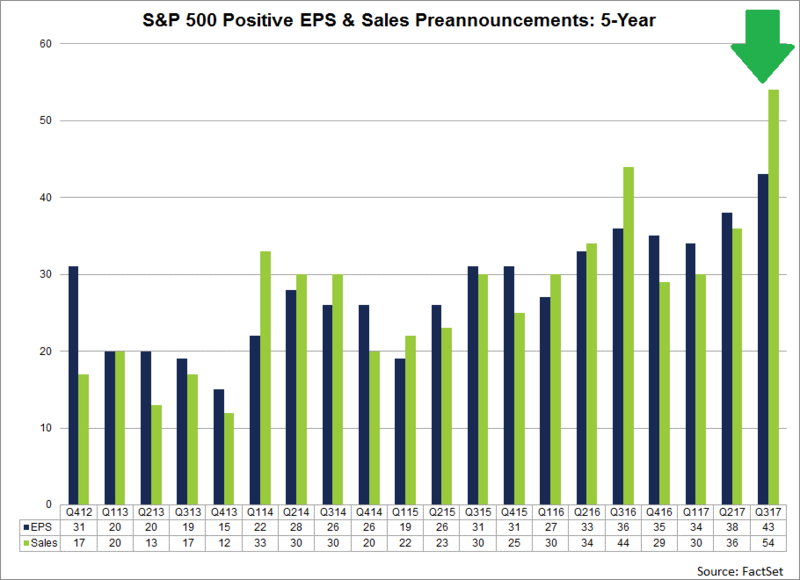 One the other other hand, the positive EPS and Sales Preannounce is also trending above 5-year and 10-year averages (see Fig. 4). 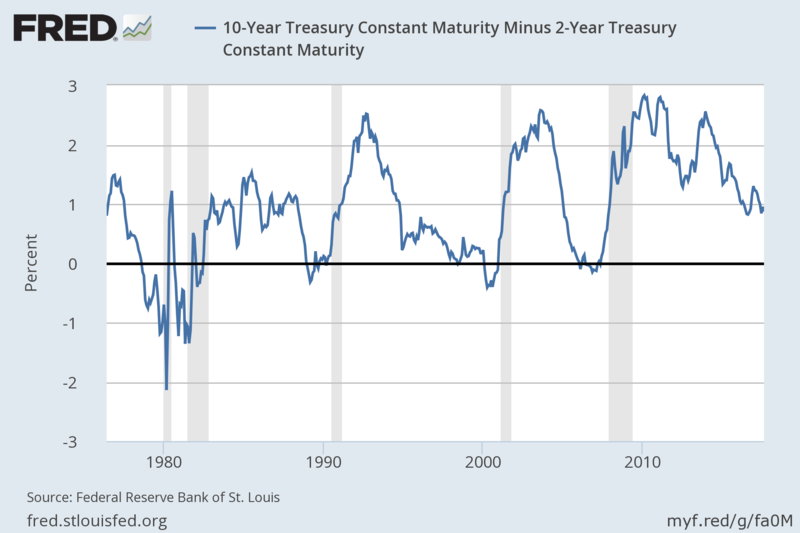 The U.S. Treasury has been on a multi decades bull run. However, in the past few month it is facing some head winds. Beginning July 2016, bond prices started a decline, from an all time high of 177.09, which stopped at 145.26 in March 2017. This was just below support created by the low of June 2015. It also coincided with the 61.8% Fibonacci retracement of the prior rally from December 2013 lows (see Chart 10). Since March 2017, the bonds are rising but they are now back at the up trend line that started from the March lows. The technical posture is still pointing up but it is precariously poised. 10-Year Treasury Yields (see Chart 11) shed some more light. Unsurprisingly, it is a mirror image of the bond price chart. The yields are moving up from the September 4 lows of 2.034 and are knocking on the downtrend line from March 2017 high. If the yields break above the downtrend line then they will have a good chance of going to 2.621 and then 3.036. But the if is big. 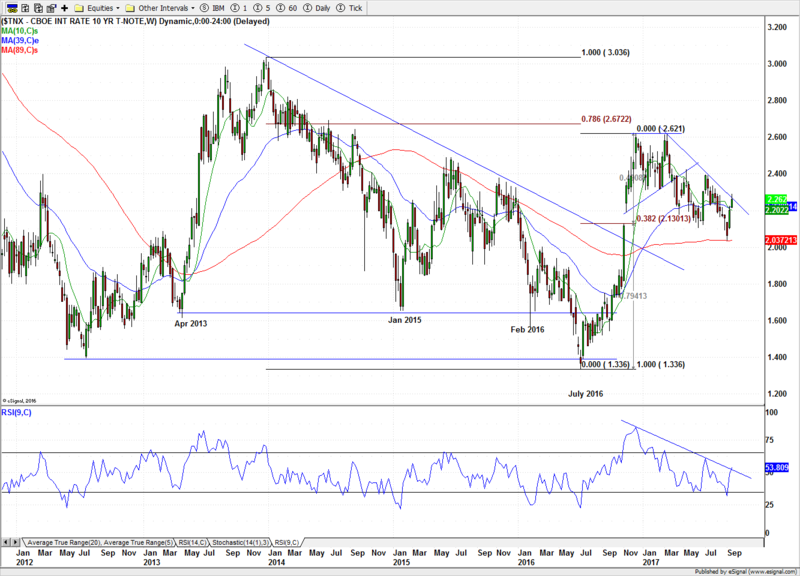 The Dollar Index has broken below a support line that lasted from January (see Chart 12). During this time, the index also carved out a horizontal channel, with a false upside break that lasted few months. The down target of the broken pattern is near 84.00 level. 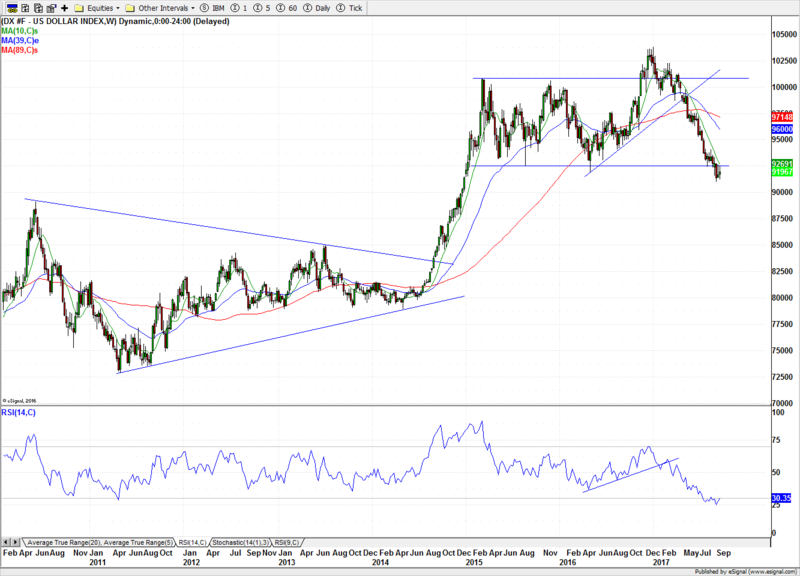 What is quite certain that U.S. dollar will be in a weakened state for some time. 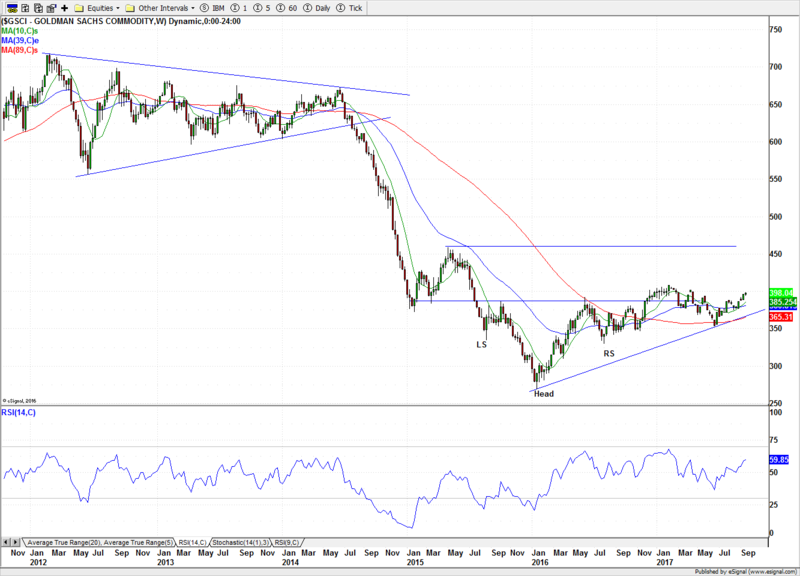 In September 2014, dollar index broke above a symmetrical triangle that lasted for previous four years. The 100% extension target of the pattern was near 100.00, which was the upper limit of the horizontal channel. The commodities have been soft for very long time but now they may be turning around. The Goldman Sachs Commodity Index is forming an uneven inverse head-&-shoulder pattern since July 2015 (see Chart 13).The first attempt to break above the neck line in December 2016 did not last long. The index is again making another attempt. 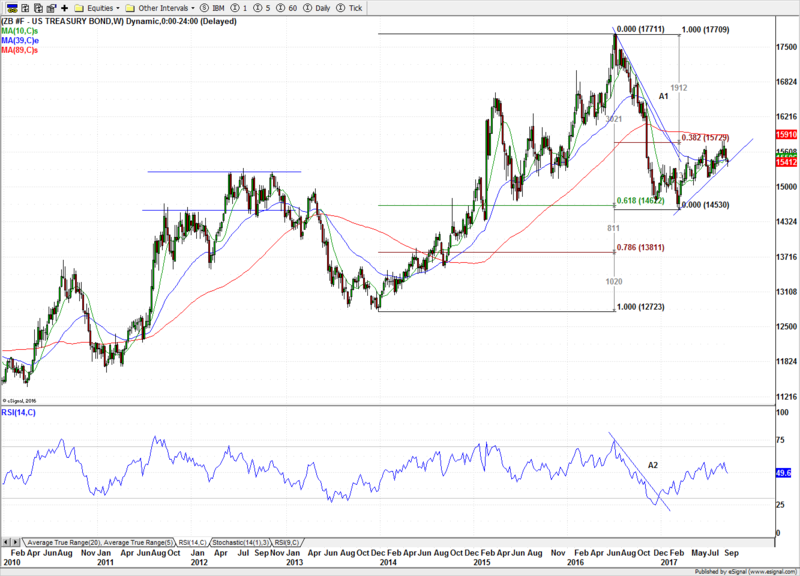 A successful attempt will have a target near 520.00 level, which is nearly 31% away from the current level. 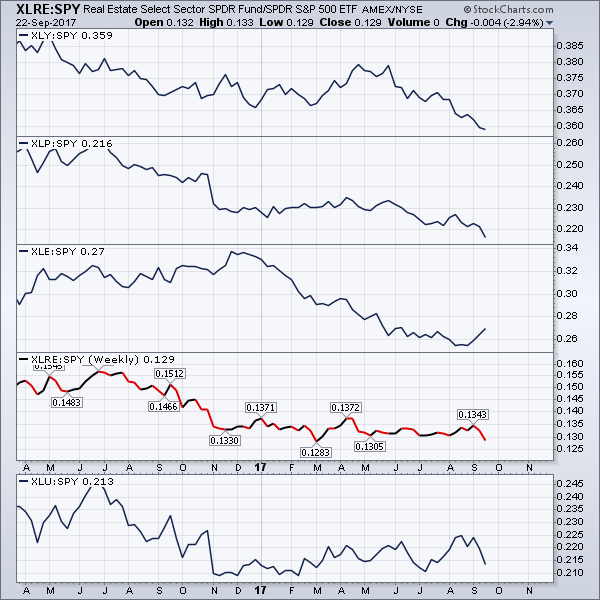 These four charts are conforming to the normal intermarket relationship. 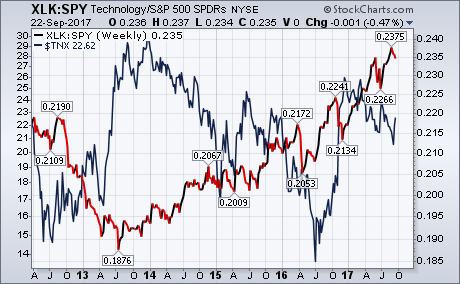 As John Murphy notes, rising yields are bad for technology stocks (see Chart 14) and good for small caps (see Chart 15). Developed Markets, iShares MSCI EAFE ETF, EFA, (First Panel Chart 16) are on an uptrend since February 2016. Emerging Markets, iShares MSCI Emerging Markets ETF, EEM, (Second Panel Chart 16) are on an uptrend since January 2016. S&P 500, SPY, is up-trending since February 2016. However, the rate of change for these markets is different. 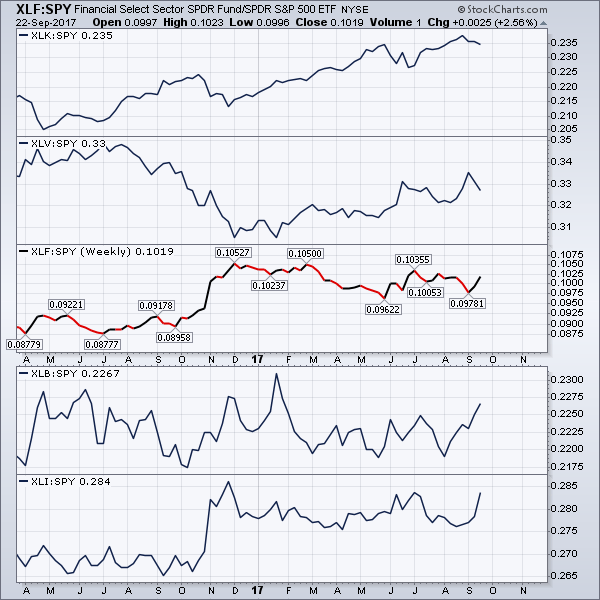 EFA outperformed SPY from March 2017 to June 2017 (Fourth Panel Chart 16). Since then their rate of return is roughly same. EEM has outperformed SPY for most of the time since February 2016 except for a brief period from October 2016 to November 2016 (fifth Panel Chart 16). 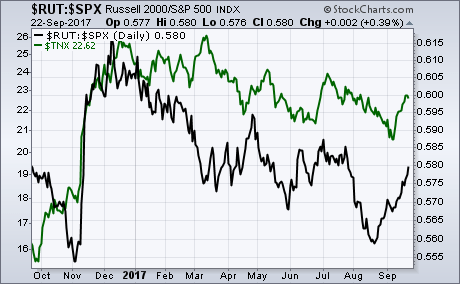 EEM has also mostly outperformed EFA since January 2016 (Sixth Panel Chart 16). The S&P 500 sectors that are generally outperforming the broader index are Technology, Healthcare, Finance, Materials and Industrial (see Chart 17). The sectors that are performing worse than SPY are Consumer Discretionary, Consumer Staples, Energy, Real Estate and Utility (see Chart 18). The overall market outlook at the moment is quite good. The technical charts are not flashing any danger signals against the current uptrend. The monetary environment is still accommodative. The economic growth, although sluggish, continues. The corporate earnings and revenue continue to increase. There are reasons to be cautious, which is mostly the case in any investing environment. The charts are saying that the interest rates have potential to rise and commodities are, perhaps, turning around. This could increase the chance of inflation, though it is not as visible at the moment. As John murphy wrote, “While the stock market is holding up okay, some rotations are going on beneath the surface. One is the rotation out of large cap tech stocks, former market leaders, into cheaper parts of the market like financials, small caps, and transports.” We also believe that rotation is happening. However, our current choices are Emerging Markets, Technology, Finance, Materials, Industrials and Healthcare.